Keep things simply elegant, with these sleek silver and pearl earrings. Crafted in a slight figure of 8 detail, these delicate cubic zirconia embellished drop earrings catch the light beautifully. Please note that these are a natural product and so variations may occur. 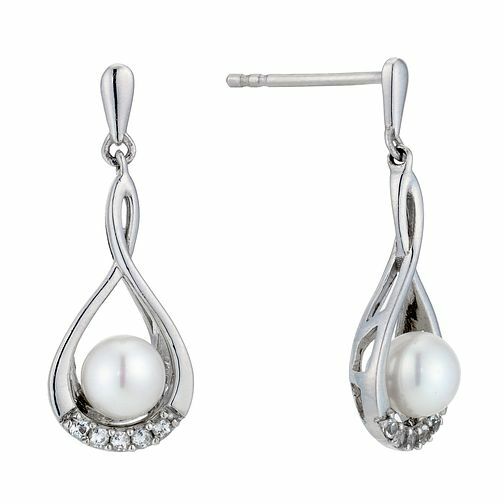 Silver, Pearl, Cubic Zirconia Figure 8 Drop Earrings is rated 4.8 out of 5 by 4. Rated 5 out of 5 by Anonymous from Elegant and chic earrings perfect for a special occasion I bought these earrings as a gift for my son's girlfriend and was a little unsure if they would be to her taste. Ordered and received very quickly before Christmas which was great. She was very pleased with them said they were perfect for her. Rated 5 out of 5 by Anonymous from Very Good Excellent earrings. Partner was very pleased with them as an xmas present.